Beautiful Lucky and Baby were born June 2012. 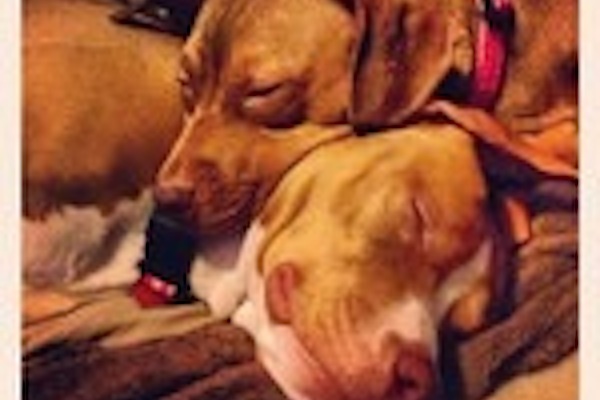 They started their life as just 2 more pitbull mixes in a shelter. They were just babies, their only name was a kennel number. Alone and scared, they were scheduled for euthanasia. Their fate was sealed until one man saw their faces and fell in love., We were able to pull the pups out of the shelter and place them with the approved adopter. In just one day they went from faceless orphans to his beloved and treasured daughters. This was over a year ago. Sadly their father has hit a terrible period in his life and will lose his home due to family issues. It breaks his heart; but, he decided it would be best for Lucky and Baby to return to Twenty Paws and find a new home together. Baby, fawn and white, is the boss of the 2. However, Lucky, the chestnut girl, is a spark plug. Together, these 2 girls’ antics will leave you with endless laughter and joy. Both girls get along with every dog and human they have ever met. When there is company, the girls wiggle and yelp with excitement. They just love meeting new humans! Rest assured their excitement can be quelled with a simple ‘No’. Lucky and Baby absolutely adore children. They grew up around them the entire time they were adopted. Both girls sit for treats, and lay down. Very gentle and affectionate, they will lick you to from your head to your toes, covering every ear, limb, and appendage. Lucky and Baby are spayed, vaccinated, and potty trained. These girls are bonded! They even stay in a crate together when left alone! They must stay together.